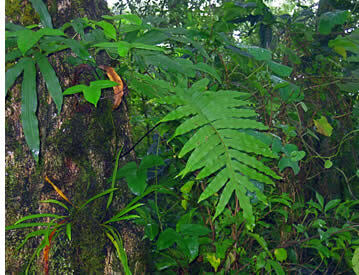 Wild rainforest plants with powerful healing properties! Medicine Way Walking Tour: an easy walking trail that takes you from the cloud forest to meadows and through wetlands, where you'll learn about various plants, their healing properties & you'll also be able to enjoy their natural beauty! About Finca Luz: a working eco-farm growing organic arabica coffee, citrus, bananas, rainforest medicinal plants and herbs, located on the side of Jaramillo Mountain above the town of Boquete, looking out to the Pacific Ocean. Mariposa Azul Cabins: spacious, fully equipped efficiency apartment for one or two with an enchanting and cozy mix of rustic and luxe. A knowledgeable bilingual (English and Spanish) guide will lead your tour on an old Indian walking trail, where you can meander through different rain forest mini eco-systems and view the plants in their natural settings. Walking the Medicine Way Trail is an educational introduction to some of these plants, the legends that surround them, the ways that Big Pharma is now attempting to exploit them and how you, personally, can utilize them for improved health and well-being. 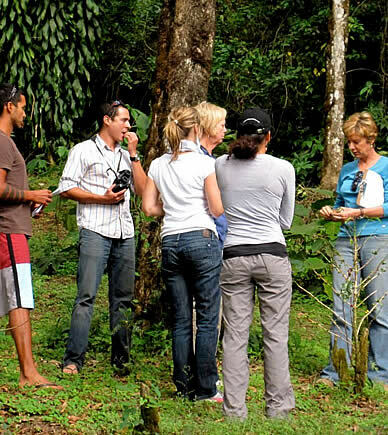 Learn to identify specific wild rain forest plants with powerful healing properties. Become acquainted with plant bio-energetics. Learn simple, effective remedies for common ailments. Look up into the shade canopy and marvel at the complex but delicate eco-systems of epiphytes, bromeliads and orchids that live in the high reaches. How many birds can you identify in the meadow? Wander down to the Meditation Pond and enjoy the tranquility of the wetland environment. Visit the experimental demonstration greenhouse. Why did we choose this design? After viewing the plants in situ, enjoy a cup of organic coffee (or herbal tea), with farm fresh sweet breads, jams and local farmers cheese. Relax on The Terrace, while we show you how the wild-crafted plants are made into our own herbal remedies, skin care products and medicines. Sample the wares. Products are for sale for your own use or to take home as unique gifts: Effective herbal tinctures for a variety of health issues including high blood pressure, liver and kidney support, digestive assistance, and mental clarity. 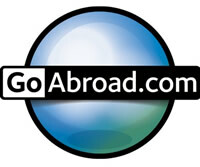 * Prices are in US Dollars. The above prices are per person and do not include Panama's 7% ITBMS Sales. Transportation from Boquete by arrangement at no additional charge. Tours are by appointment. Monday — Wednesday — Friday, 9:30 a.m.. Afternoon tours at 2 p.m. during January – April. Allow 2 – 2.5 hours for your visit. Please wear appropriate walking shoes. NO high heels or flip flops. Bring your camera. Bring a birding or tree book if you want to do some additional exploring. Boquete's Cloud Forest is your gateway to the most diverse ecology in the Western Hemisphere. Finca Luz is a patch of Panamanian paradise on the side of Jaramillo Mountain above Boquete, looking out to the Pacific Ocean. Elevation is just under 1,500 meters. 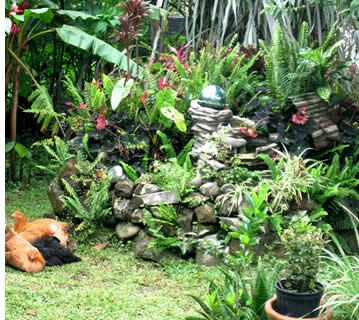 Finca Luz is a working eco-farm growing organic arabica coffee, citrus, bananas, rainforest medicinal plants and herbs. Finca Luz is a work in progress. It was neglected for over 20 years and the jungle was happy to reclaim it. This turned out to be a good thing, as the land was washed clean of chemicals and naturally reverted to "organic". For the past 10 years, the Finca Luz team has been working in harmony with the land to restore the coffee fields, build gardens, and create a sustainable, eco-farm. The work is far from done. 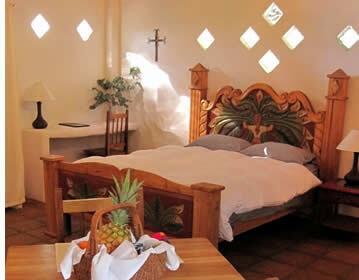 Finca Luz still wears a rustic face, but it is now a gloriously welcoming and lovely nature sanctuary. 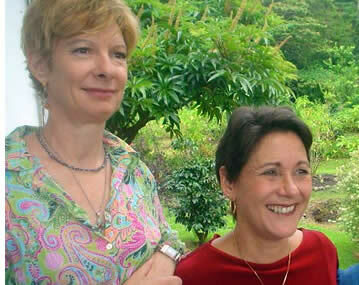 Your hosts at Finca Luz are Elizabeth Worley and Dianne Heidke. Dianne Heidke, from Australia, has been the coordinator/moderator for the Tuesday Morning Community meetings for over 6 years. She is the author of The Boquete (Not for Tourists) Handbook, now in its second edition. She has owned The Zapadora, an import business in Potrerillos, for 6 years. She is The Zapadora, a female explorer, and the Supreme Ruler of her life. She has an extensive background in ethnobotany and research. Elizabeth Worley, from the US, is an author, organic farmer, and alchemist (that means she takes ordinary things and transforms them into things extraordinary, usually in the kitchen!). She is the author of Risking Everything, a memoir of moving to Panama and how it changed her life. She studied herbalism and plants with the Wise Women and Cherokee Indians of the Blue Ridge Mountains in NC. Cabaña Mariposa Azul (that's Spanish for "blue butterfly" ) is a spacious, fully equipped efficiency apartment for one or two in Boquete Panama. An enchanting and cozy mix of rustic and luxe, the cloud forest cabin is beautifully fitted with exotic furnishings from Egypt, Mexico, and Central America. A wide covered front porch invites you to sip locally grown organic coffee, listen to the birds, lounge in the hammock and enjoy the tranquility of the mountainside. Prepare your own meals in the compact kitchenette, eat out in one of Boquete's many restaurants (from budget typical to elegant continental, and everything in between), or by special arrangement, Finca Luz' hostess will prepare a special gourmet meal served to you in your cabin. Optional extras: picnic lunches, afternoon teas and dinners can all be prepared and delivered to the cabana by advance arrangement. Discover the Cloud Forest's Healing Power! 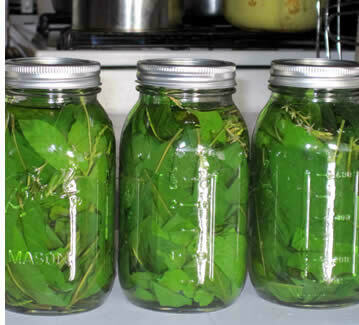 Get your botanical remedies today... Contact us!